You can unlock your trial copy of Restoration Manager instantly using your PayPal account, credit or debit card. We're delighted to announce that the UK Personal Computer World magazine recommended Restoration Manager in its March 2006 issue and overall awarded 5 stars. If you would like to be kept up to date with news, updates and special offers from Restoration Manager plus news from the restoration world, please subscribe to our free email newsletter. Car restoration and bike restoration is an immensely rewarding activity. It's not without challenges and frustrations, particularly if your car or bike is unusual, but the thought of driving your dream vehicle out of the garage or workshop will keep you going as you reassemble a huge engineering jigsaw. Recording details and notes about parts as they are removed from the vehicle - Restoration Manager generates a unique number for every part entered and can even print a label with this information on it - invaluable later in the restoration when you are trying to identify or locate a part. Identifying the restoration tasks required on a part - powerful reporting facilities allow you to identify what parts need to have a specific task performed on them, providing a packing list when sending parts away. Never again spend unnecessary money sending a couple of parts you forgot to include. When the parts are returned you have a check-off list to make sure everything is returned. Handy jobs list shows what needs to be done to finish restoration on a part or group of parts, or list the parts that need a particular task carried out on them, making it easy to check parts back in when they come back from, for example, blasting. Quick visual indication of which parts, groups and phases are complete - know exactly where you are in the project. Create a list of component parts, for example nuts, bolts, gaskets, etc required for restoration or reassembly. The easy to use reporting feature allows you to create a shopping list - great if you want to tackle a specific job over the weekend and don't want to keep running to the shops for parts, or worst still lose a weekend's work because you can't get hold of a specific component. Organise digital photographs, with the ability to add notes. When reassembling the parts, the photographs will be easily at hand reminding you of how the part was originally fixed to the vehicle. Combined with the notes entered when the part was removed, it's almost like traveling back in time. No more head scratching trying to remember how, where and possibly why the part was fitted. A powerful search tool has been included. Using search you can identify what a part is and and all of the notes and photographs you have entered about from its unique reference number - helpful when you don't recognise a part (and with thousands of parts in a vehicle it's hard to recognise everything), search for information in notes and descriptions. When the restoration is complete you have a fantastic record of the work you carried out, very useful if you or a friend decide to restore a similar vehicle, or to show to prospective purchasers. Can you see how that would be useful? 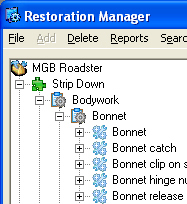 Restoration Manager has been designed to work and tested on a low specification PC, running Windows 98 or later, the sort of PC available cheaply from your local paper's classified advertisements or from eBay. The only limitation is disk space for your digital images, although hard drive space is cheap and it's relatively easy to add another hard drive to store your photographs on. We passionately believe that Restoration Manager will help you restore your vehicle quicker, provided that you take the time to enter as much information and take as many photographs as possible at the strip down phase. This will increase the time it takes to strip down the vehicle, but think of it as preparation for the restoration and assembly phase, which will be much quicker and less stressful without having to search for missing parts, try and identify a part you just don't recognise and spend hours attempting to refit parts that you don't remember taking off.